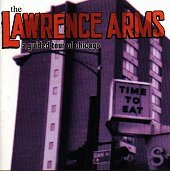 Out of the ashes of the Broadways comes the Lawrence Arms, another Chicago three-piece political punk act. The sound is similar to the Broadways, due to the fact its core songwriting team is the same (Brendan and Chris). Though, the melodic sense coupled with the harsh punk and political take on life, which the Broadways were all about, seems to be lacking here. The punk charge and political words are present, but the melodic sense isn't. "An Evening of Extraordinary Circumstance" rockets through with harsh vocals, slamming punk beats, and an overall edgy feel that quickly establishes the album as a sonic blast of punk (and a touch of emo here and there) that will be all energy from start to finish. And that is exactly what it is. "Kevin Costner's Casino," "Take One Down and Pass It Around," "Someday We're All Gonna Weigh 400 lbs.," and "Uptown Free Radio" are all very similar songs in style and sound, but it is the politically focused lyrics that help differ one another from the other. What you get with the Lawrence Arms is the same thing you got with the Broadways: quick, sharp punk rock that focused on political issues and went non-stop from the first guitar chord to the final drum beat. Though, A GUIDED TOUR OF CHICAGO doesn't reach the addictive-ness or the power that BROKEN STAR, the Broadways' debut full-length, reached, it is still a good album. It has the aggression, power, and attitude that the Broadways thrived on. Now, they just need a few tours behind them and more practice. I'll give the album a B.